SM Entertainment (CODE 041510) showed earning shock [economic performance shows a lot lower than expectation]. Its business profits in this third-quarter were below analysts’ estimated profit – which were less than half of estimated figure. SM submitted its report of this quarter to the Financial Supervisory Service at 14:12 without any public announcement. According to the report, its business profits for third-quarter was 11.7 billion KRW. It was more than the last third-quarter, but a lot less than expectation of stock market. Analysts had estimated its third-quarter’s business profits to be 20~23 billion KRW. The stock price responded immediately. It started to falling slowly right after its report, and hit the floor of the lower limit at 14:25. 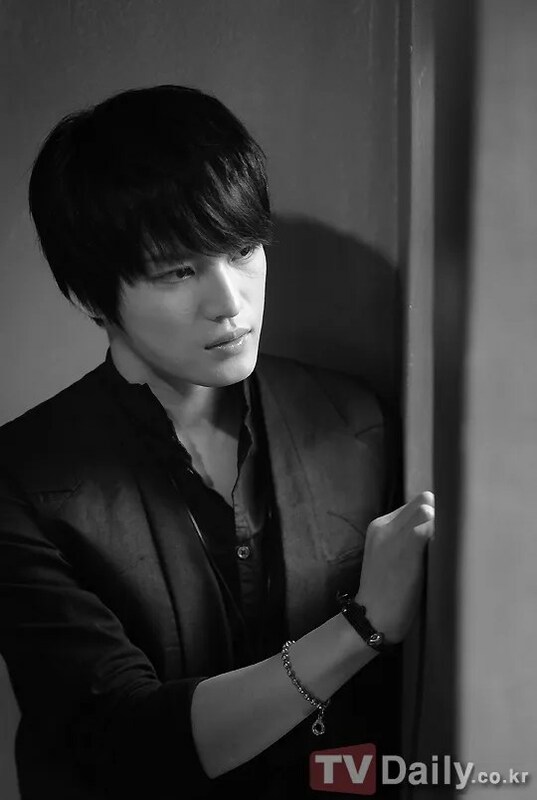 JYJ’s Kim Jaejoong recently greeted viewers with his first film starring role in ‘Jackal is Coming’. In an interview conducted on November 13th, Kim Jaejoong expressed his helplessness regarding ‘fake Kim Jaejoong’. Meanwhile, the film ‘Jackal is Coming’ starring Kim Jaejoong and Song Ji Hyo will air in cinemas from November 15th onwards and is rated suitable for viewers aged 15 and above. The movie, Codename: Jackal, had launched an extraordinary sneak preview session. 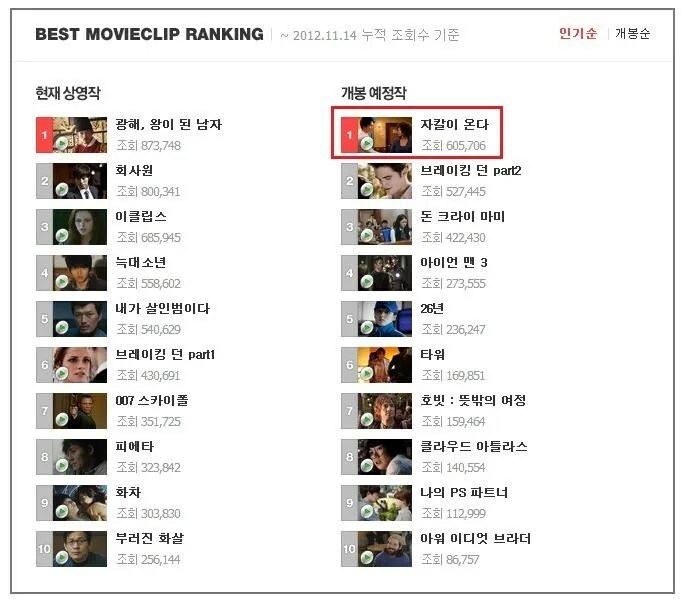 On 12 Nov 2012, there were 100s of Song Ji Hyo and Kim Jae Joong present. Actually, it is planned by one of the Jae Joong’s fanclub, Prickly noonas of heroses, to make the sneak preview special. This had caught the attention of many people. Many fans, ranging from students to pregnant women, to men above 30 were present at the sneak preview. The theatre was full house. 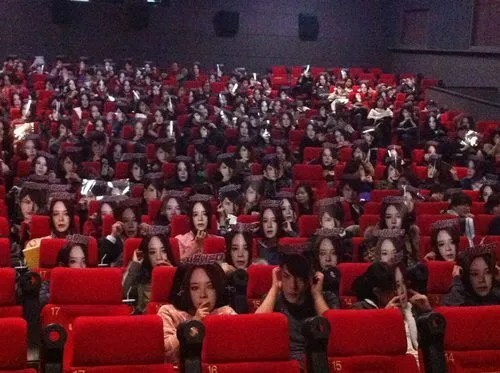 Before the movie commence, all the fans wore the mask and took a group photo. They are planning to upload it on Codename:Jackal promotional website to support the movie. Codename: Jackal is a movie about how a legendary killer (Song Ji Hyo) has kidnapped the lady killer Hallyu Star (Kim Jae Joong). The official release date is 15 Nov 2012.
i am very happy because of this news…… This is not about search any sensation or attention but it’s more about care,love and other people in need. Despite being treat unfairness and must faced many struggle moment but it doesn’t mean that the boys forget to other people especially the needy one. The humble and kind heart of the boys already enough to warm and moving my heart to do the same. If ugliness and evilness with a dirty and coward tried to bring the boys down then the love, care and kindness can makes us to be more strong. 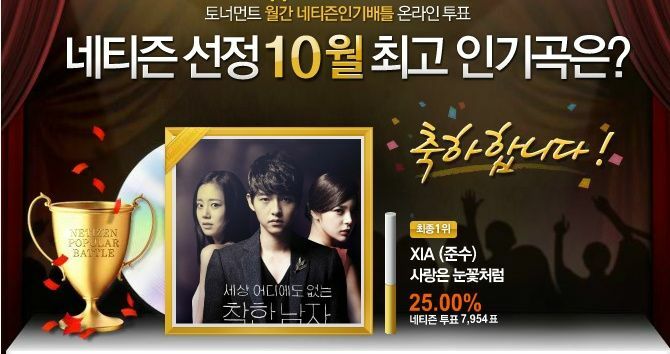 Group JYJ (Kim Jaejoong, Park Yuchun, Kim Junsu) has been hailed as King of Donations this year. 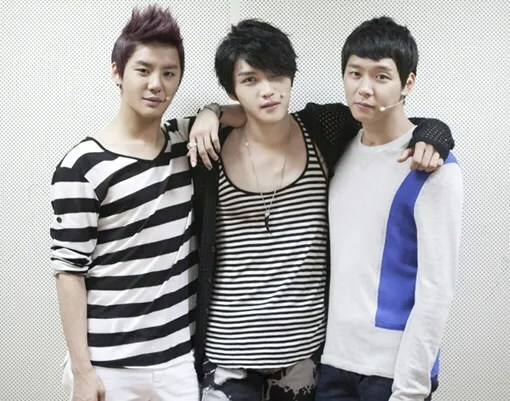 Since the beginning of the year until Nov 13, JYJ has donated a total of 45 tons of rice which is heartwarming to read. JYJ’s fans participate en masse, thus becoming good models for fandoms. Every time JYJ has official events like dramas, movie, musicals, concerts, fan meetings, and others, fans purchased these wreaths in the name of the members to show support and to give these wreaths to people in need. JYJ fans from Korea and other parts of Asia such as Japan, China, Taiwan, as well as from other places including Americas and Europe, have sent rice wreaths to help disadvantaged children, elderly welfare centers, and other social welfare centers domestically. The rice wreaths amounting to 112,500,000 KRW (~103,000 USD) are enough to feed 7,800 people. huh…..so the boys can’t sing in the stage but only gonna attend the official opening ceremony……..’sigh’ even though i felt disappointed because of this fact but i am glad that if Japanese fans can see and meet the boys and i guess it’s enough for exchange their feelings each other. The boys also must be happy because of this. JYJ will depart for Japan to attend the official opening ceremony of the Korea-Japan Exchange Exhibition on the 15th. 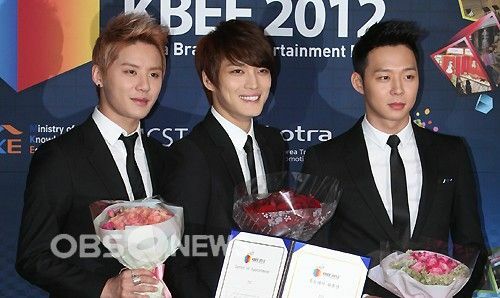 JYJ, appointed last Sept 17 at the KOTRA headquarters, will start to do full-pledged activities as ambassadors for KBEE. Their first public activity is to take part in the 2012 KBEE on Nov 14-16 to be held in Osaka. Despite their busy schedule, JYJ found the time to do their role as ambassadors. Kim Jaejoong is busy promoting his new movie “Jackal is Coming’ that will released on the 15th. Park Yoochun is busy filming for his drama ‘I miss you’. Kim Junsu is busy doing preparations for his Germany concert on the 30th. On the other hand, JYJ, as representative of the Hallyu wave, is planning to actively cooperate in order to promote to the youth a future-oriented image that can lead to a variety of Korea-Japan exchanges. JYJ is going to Japan to attend for an official opening ceremony of ‘Interchange Exhibition of South Korea and Japan’ on 15th. JYJ announced the start of authentic activities as an ambassador of ‘Interchange Exhibition of South Korea and Japan 2012’ at KOTRA on October 17. As the first promotion activity, the members of JYJ are attending for the exhibition that is held at Osaka in Japan from November 14 to 16. Especially, it’s noticed that the members of JYJ are doing their roles as ambassadors in spite of busy schedules. Kim Jae-Joong is having busy days for promotions of his movie ‘Jackal Is Coming’ which is going to be released on 15th, Park Yu-Cheon is taking shootings for his drama ‘I Miss You’, and Kim Jun-Su is also concentrating on practicing of his concert in Germany on 30th. JYJ is going to attend for the official opening ceremony with musician Park Hyo-Shin on 15th. However, JYJ is not going to be on stage that other K-POP musicians are going to have performances. Meanwhile, JYJ is going to participate in promotions of young and future-oriented atmosphere of interchange of South Korea and Japan as a representative Hallyu musician of Korea.